In his opening address at Esri's 27th annual International User Conference, company president Jack Dangermond set the tone for the weeklong event by announcing that the conference theme, The Geographic Approach, emphasized the unique perspective for analysis and understanding offered through geography and GIS technology. 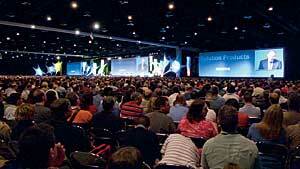 The conference was held this past June in the San Diego Convention Center in San Diego, California. 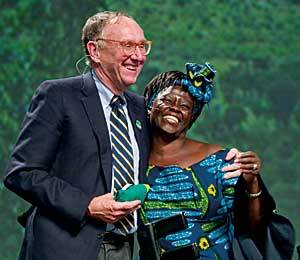 Jack Dangermond with Wangari Maathai at Esri's 27th annual International User Conference. "Today, the world has many pressing problems for which we must find solutions, including an ever-increasing population, global warming, social conflict, natural resource shortages, loss of biodiversity, and security concerns," said Dangermond. "GIS provides both the framework for a comprehensive situational view of these challenges and the analytical capabilities required to develop sustainable solutions to resolve them. GIS equips the user with the tools, methods, and workflows to support collaboration and action." David Maguire, director of product planning at Esri, discussed the improved geoprocessing capabilities coming in ArcGIS 9.3, its support for advanced statistical analysis and geographic visualization, and how it can be applied to scientific computation. The impact variables have on causing an event to occur can be statistically computed to predict trends. Regression analysis is a common statistical method for explaining or predicting how events are impacted by a variety of factors. Geospatial regression modeling can be applied to better understand how given factors affect crime, pollution, public health, atmospheric pollution, forest timber, and most any other type of geospatial relationship researchers study. Esri's GIS technology expert Bernard Szukalski introduced ArcGIS Online Services, a collection of ready-to-use maps and reference layers hosted by Esri. They have been created as a foundation for GIS work and are free for ArcGIS Desktop software customers. He also demonstrated how ArcGIS Explorer accesses, integrates, and uses GIS services, geographic content, and other Web services. These services were introduced through a series of live demonstrations that proved the value of having immediate access to cartographically designed online basemaps that can be quickly and easily added to the mapmaker's own data. The first example showed how ArcGIS Online Services, deeply integrated with ArcGIS, can be used in a project to save time. ArcMap was opened with a partial map showing transmission lines in a multistate area. The map was missing a basemap or foundation for the local content. Szukalski then visited the ArcGIS Online Web site, located some ready-to-use layer files, and saved those locally. With a simple drag-and-drop maneuver, he was able to add the layer files to his project, which connected his map to the ArcGIS Online basemap. He showed several examples of these, using different ArcGIS Online Services, including the one-meter resolution U.S. imagery service and U.S. Streets service. Also detailed was the development of ArcWeb Services, which is leading the evolution of GIS to an Internet-based system that is interconnected, interoperable, integrated, and dynamic. Recognition for exceptional contributions to the development and use of geospatial technologies is an important aspect of the conference. This year, the President's Award was presented to the Nature Conservancy, while the Lifetime Achievement Award went to Don Cooke, founder of Geographic Data Technology (GDT). The Saudi Aramco Corporation was recognized for making a difference in the lives of others with the Distinguished Service in GIS Award. One hundred sixty-five companies throughout the world received Special Achievement in GIS (SAG) awards. Another highlight of the annual User Conference is the Map Gallery exhibition, where Esri's user community can display mapmaking techniques and creativity. This year, more than 1,000 maps were entered into the 15-category competition. The exhibition depicted the wide range of applications being developed by GIS users from ArcGIS as a Gameplay? entered by Masaryk University in the Czech Republic to GIS-Based Risk Management for Offshore Wind Energy Turbine by Ludwig-Maximilians-Universit�t in Germany. The conference included more than 300 technical workshops, 900 user presentations, 100 user group meetings, and 1,000 business partners offering a variety of solutions and services. Concurrent conferences included the Esri Education User Conference (EdUC); the Esri Survey & Engineering GIS Summit; and the inaugural National HAZUS User Conference, hosted by the Federal Emergency Management Agency (FEMA). Esri's 28th annual International User Conference is scheduled for August 48, 2008, at the San Diego Convention Center in San Diego, California. Details regarding the submission of abstracts and related deadlines will soon be available at www.esri.com/uc.